Having a thoroughly stocked contingent of supplies is necessary for any art enthusiast, be they a professional or just a novice enthusiast. This includes having on hand top of the line markers, which can be used in a pinch to solve any number of crafting problems. The Prismacolor line of markers is an excellent brand to rely on as it delivers top-notch results that look far and beyond what you remember from grade school markers. These markers have plenty to recommend them and come in all manner of rich, vibrant colors. One of the best advantages of using the Prismacolor brand is its high level of professionalism, which can be seen in all ranges of its products, from the actual markers to accessories like marker cases. These products are not child's play, but instead meant to give a high quality finish that the professionals love to use to complete their projects. But novices can take advantage of these markers as well, to get vibrant colors and smooth finishes, qualities that set the Prismacolor brand apart from other, similar competitors. When sitting down to complete any sort of art or craft project, Prismacolor is the brand to consider. These markers are double-ended, with a broad nib and a fine nib, with a single ink reservoir for perfect color match. The markers can be used to make custom paper crafts, to stencil, or to do script on a personalized project. Any time one might use a basic brand of marker, the Prismacolor marker can be substituted to give a cleaner, more professional look. The markers are easy to use and easy to clean up, with perfect results. They are also easy to find and purchase at most local art stores or online. Once you have the ultimate in markers, you are going to need somewhere to store them. You do not want to let these quality makers just roll around without protection, and a Prismacolor marker case is the perfect solution to fix this problem. This sort of marker case will keep all of your markers organized and in one place, so none of the markers get lost or damaged. It is the ideal way to have all of your colors close at hand, so nothing gets misplaced, and you can see at once all of the shades you have to choose from. 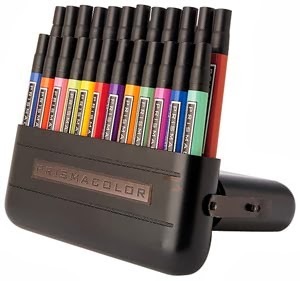 Fortunately, if you buy these professional grade markers in a set of 24 instead of individually, Prismacolor provides a very nifty flip-up hard shell case that when opened, holds your makers upright and ready to be chosen. The set of 48 comes with a slim metal carrying case that would easily slip into a backpack, briefcase or even a purse. With the holiday season fast approaching, consider one of these fine marker sets as the perfect gift for your favorite crafter or artist. There isn't one who hasn't lusted over these sets of markers when cruising the aisles in their favorite art or craft supply store. You might think to yourself, "Oh, they're just a set of markers", but they're not just any set - they're the ultimate of their kind. Trust us on this. Choosing a line of markers to rely on can sometimes feel like a hassle, as you do not want to pick up one brand only to discover the markers deliver a sub par result. Relying on Prismacolor removes this problem, as the line of markers and accessories consistently delivers a professional look with excellent results. Prismacolor is easy to purchase and even easier to use, bringing a smile to the face of anyone who picks one of these markers up to use on a project.